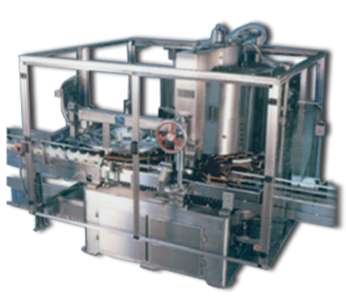 The Diversified Capping Equipment, now Dillin Capping Systems, Rotary Steam Vacuum Cappers are designed to apply continuous thread or lug caps to glass or plastic containers. Uncapped containers are supplied to the capper infeed worm by a conveyor that can also be provided by Dillin. An indexing worm spaces containers into the infeed star wheel. A cap feed mechanism feeds a cap for each container into a rotating cap feed disc where it is picked up by a chuck on a spindle assembly. The cap and container pass through a stem insertion area. As the spindle assemblies rotate about the turret, they move vertically by means of a cam. The cam is designed to accurately position the cap chuck over the various pick-up and release points of the cap. Adjustments can be made to the magnetic clutches for various torque requirements. The capped container is transferred back onto the conveyor by means of a discharge star wheel.